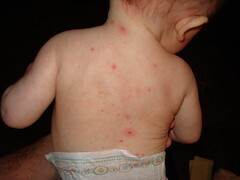 I’ll have a picture to post later on; however, we think Lydia has Chicken Pox. What’s good about that? 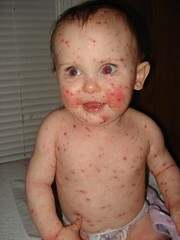 Well, now we have a reason the doctor will like for us not giving her the chicken pox vaccine. I hate it that she’s sick, especially since she’s getting over a cold and working on a tooth. I also feel terrible that I might have unwittingly exposed people at church last night. My family keeps reminding me that there’s no way to know before they start breaking out, but I still feel bad. I know chickenpox isn’t the end of the world, and you can’t live in a bubble to protect yourself or others from exposure, but it’s hard not to feel guilty. Did I take her out too much? Clean too little? What if someone catches it from her? Or caught it from her before we knew what was going on? These thoughts have been running a wild circle through my mind all evening. This mommy stuff is hard! I’m just thankful that I’m not in this alone. God is in control and He knows all about this situation, and He has blessed us with loving, supportive family and friends. We’ll post more updates as the situation unfolds. [Update 12-03-2007 07:17:44] It looks like her fever broke last night . Thanks to all who were praying. [Update 07-09-2008 14:11:41] I posted a few more pictures in this post . If you want to know why I came across them now, go read that post too. It’s nearly month 10, which means it is way past time for an update. Our little one continues to grow and thrive…though she’s definitely on the dainty side, weighing just under 16 lbs. at her 9-month check-up. Her sleep has been pretty out of whack since we went to a conference in October and left her with Grandma and Grandpa Maxson for 3 day. On top of that, we’ve since spent a lot of time traveling and haven’t had a very predictable routine. And just yesterday, I spotted another potential cause. Lydia’s first tooth is on the way! It’s the lower front tooth on the left and it’s starting to break the gum. We’ll see how long it takes to actually come in. She’s eating Stage 3 foods and is starting to explore textures. We’ve given her those puff things and apple wheels. She also enjoys bananas and licking crackers/cookies. And Matt even gave her mashed potatoes, mushed corn, and a little piece of turkey to gnaw on Thanksgiving . I tried a little piece of hamburger one day, but she wasn’t quite ready for that. We’ve got some pasta for her to try and I’m working on getting her to drink soy formula part of the time as we look to weaning her in the next couple of months. Lydia loves to play and investigate everything and continues to be pretty happy and adaptable. She only wants mommy from time to time, but generally is fine going to the nursery or getting passed around. We’re very blessed by our precious girl and God continues to refine us as we face the challenges of each day. She’s “talking” to me now, so that’s my cue to close. We may get new pics up eventally, but I make no promises! Perhaps they see and hear about the massive layoffs that happened just a few years ago that are preventing people from flying for the majors. Perhaps they talk to people like my dad who love to fly but at the peak of their career can’t even get Christmas off. At a time when a senior captain should be flying an international schedule of his choice, many pilots can’t even get their last Christmas off. Once the airlines start treating their pilots like the skilled profesionals they are instead of a number, you’ll see more people going into the profession. I came across these two videos while surfing you tube tonight. I was reading some technology news this morning when I came across this article talking about the Internet getting full (actually running out of capacity). The main point of the article? How does adding broadband connections in new houses help the core providers increase capacity? If anything, that stupid law would increase demand and speed the “demise” of the Internet (that won’t happen, but the article claims it will). Why can’t people think logically when they write things? Why can they not extrapolate out the impact of what they are thinking? I don’t like this. And I don’t like Rick Warren. I don’t care what he says, this does nothing to advance the Kingdom. Why? I don’t see how a person can be a Christian (a real saved Christian…one who follows Jesus…not simply a cultural Christian) and support someone who believes it is ok to kill little babies (aka abortion). How does being unequally yoked with an unbeliever advance the Kingdom? Thanks to everyone who helped us with the sale by helping and buying stuff! Just in case you are interested, we do have some leftovers. For more information, look at this post . I came across this guy’s blog post about the creation museum while reading another blog this morning before work. I’ll link to it but be warned…his post isn’t the best. You’ll have to read past some bad language to get to the point I wanted to bring up. Let me say this much: I have to admit admiration for the pure balls-out, high-octane creationism that’s on offer here. Not for the Creation Museum that mamby-pamby weak sauce known as “Intelligent Design,” which tries to slip God by as some random designer, who just sort of got the ball rolling by accident. Screw that, pal: The Creation Museum’s God is hands on! He made every one of those animals from the damn mud and he did it no earlier than 4004 BC, or thereabouts. It’s all there in the book, son, all you have to do is look. What do we need to learn from this? We need to unashamedly stand up for the truth. We shouldn’t gloss it over. We shouldn’t worry about who it offends. We need to speak the entire council of God’s Word and stand up for it. Yes, we are going to get attacked…but I would rather be attacked for believing the truth instead of doing what these guys are doing. What in the world is “non-negative?” Isn’t that positive? Is there some grey area that represents not negative and not positive?